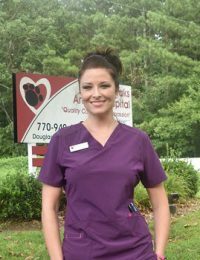 Amanda grew up in Douglasville and has worked since she was 15. Amanda is a proud mommy of a handsome 4 year old son. She has always had a passion for animals since she was a little girl. From rescuing baby bats, squirrels and other animals along the way, Amanda was the girl that literally stopped in the middle of the road on a hill just to get the turtle out of the road. And of course take it home and release it in a better area. Thankfully, Amanda came across the website for Animal Behavior College. Next thing you know everything fell into place for her to become a Certified Veterinary Assistant. As a woman of faith, Amanda knew it was meant to be. It’s great to be in a career path that she’s passionate about. Amanda absolutely loves her new work family and the facility she works for. © 2019 Douglas Oaks Animal Hospital.